The Hunter 50: A Dying Breed? Offshore mono-hulls demand a market share because of inherent comfort, performance, and durability trade-offs as compared to multi-hulls. But I question sometimes the longterm viability of production mono-hulls for cruising, those vessels under the brandnames Bavaria, Beneteau, Catalina, Hunter, Jeaneau, etcetera which are targeting more towards island hopping and coastal cruising than circumnavigation. Their design trajectory towards ever beamier widths and higher cabintrunks naturally ends in a catamaran design. Why would one purchase a production mono-hull when it seems their goals would be best realised with two hulls? At the low end it is partially price. 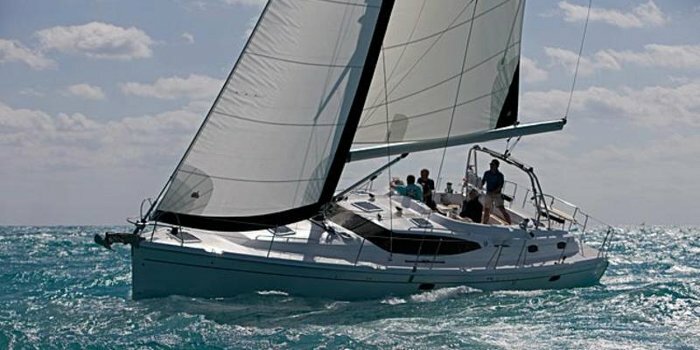 If you are looking at under 40-foot, production mono-hulls, they do not make many under 30-foot catamaran (the 10-foot difference is the baseline for comparing accommodations, ie. a 50-foot mono-hull is equivalent to a 40-foot catamaran). But at over 40-foot the options open up, and at over 50-foot you have many choices for an equivalent catamaran to match the price and accommodations of your production mono-hull. Another price related argument is the cost of berths and haul-outs. It is true that berth prices can be double that of a mono-hull because of the difficulty in accommodating the extreme beam of a cat. But this beam issue is a facet of infrastructure and a short term one. New marina’s are being built to accommodate cats, and with ever increasingly sophisticated equipment, yard’s are able to more easily lift cats. Looking in the long-term, the costs of owning a cat will come down, and cat benefits like minimal draft and stability on the hard could make berth and lift costs increasingly reasonable. So assuming we are in the larger market, cost issues will be mitigated in the long-term, and performance issues are less important than accommodations, what are the benefits to choosing a 50′ Hunter versus a 40′ Lagoon?